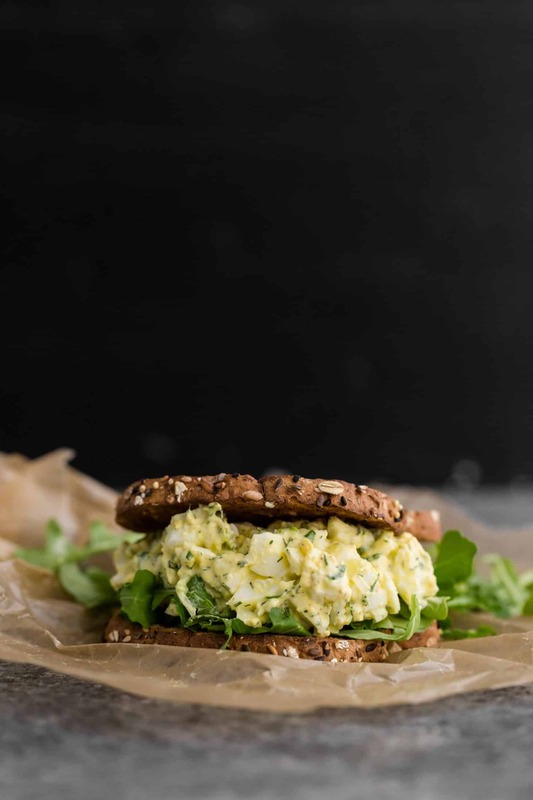 Given this whole month revolved around lunch, it felt right to finally share my recipe for egg salad. For the longest time I shied away from mayo-based salads but over the years, they’ve grown on me. The key, I’ve found, is just enough mayo to hold the salad together and not a scoop more (plus lots of herbs). Better yet? I made this ramen bowl with eggs for dinner, cooked a few eggs for a little longer, and made egg salad for the next day- it’s a win/win situation! Peel eggs and place in a bowl. Chop/mash with fork, leaving some bigger pieces. Add the herbs, scallions, mayo, lemon juice, mustard, salt, and pepper. Mix well, taste, and add more salt/pepper as desired (see note). Assemble sandwich with an extra slather of mustard as desired. + I’m always adjusting the amount of salt, pepper + mustard based on my taste. Play around with the amounts and adjust as desired. + My favorite way to hard boil eggs. Add Crunch: I don’t always have celery around but when I do, I add small pieces to the egg salad along with a handful of sunflower seeds. Add Avocado: Whip avocado and use it with or in place of the mayo. Make it vegan: Use tofu and vegan mayonnaise! Drain tofu as much as possible, press between towels to get it dry then crumble and mix as you would the egg. Yummm! Love the idea of adding fresh herbs and arugula. 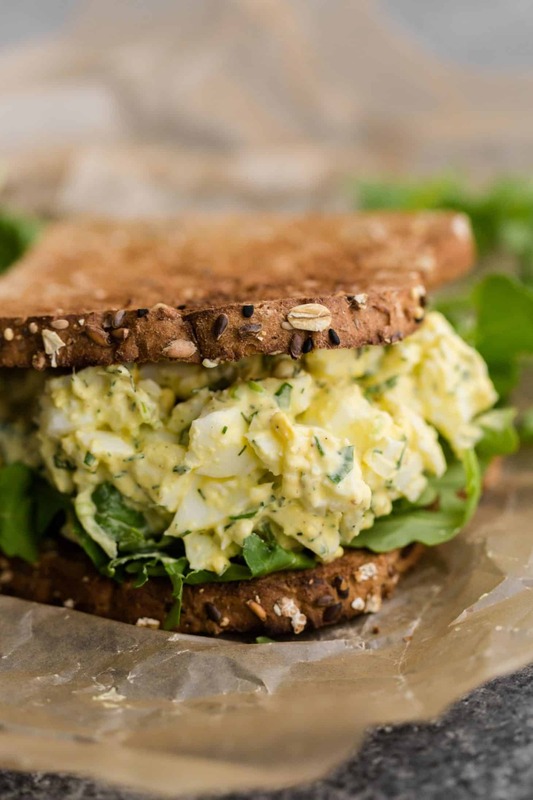 Egg salad is just so good. Looking forward to trying your sunflower seed for crunch variation. You have no idea how obsessed i am eith eggs and egg salad! Cant wait to try this! Have you ever tried celery salt instead of salt in egg salad nom nom nom. I feel you on trying to avoid mayo. Like, I don’t hate it, but the thought of shoveling unnecessary mayo fat into my food isn’t pleasant. But sometimes the unnecessary is necessary! Such as in egg salad or pimento cheese. Your egg salad looks delish. Nice recipe !! It’s easy to make and perfect for a quick breakfast before getting to work! 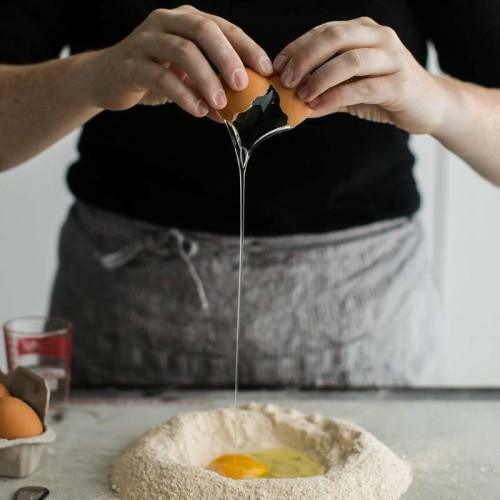 For vegan egg salad I’d suggest a mixture between tofu, drained and scrambled as you’re describing, slightly overcooked pasta (Penne goes well here), and for the egg taste Kala Namak, indian stone salt. 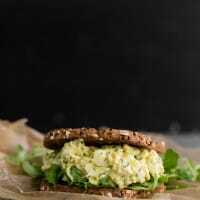 Mixed together, this is a perfect vegan egg salad!